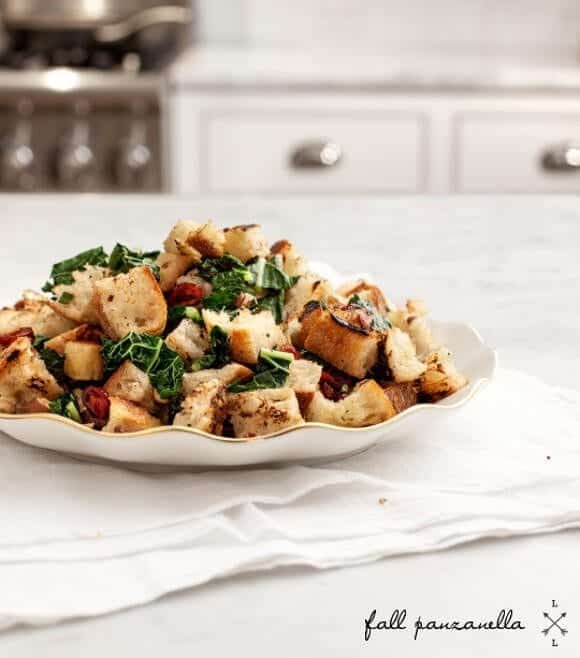 A delicious stuffing/panzanella hybrid, this healthy fall salad full of tangy sautéed mushrooms and crispy kale makes the perfect Thanksgiving side. Vegan. 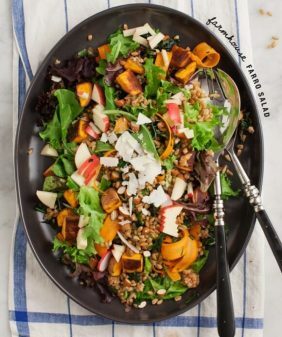 Panzanella is one of my favorite summertime salads, so I thought, why not make a fall version using some stuffing-esque ingredients? Instead of juicy tomatoes, I sautéed some mushrooms and added tangy dried cranberries. Instead of sweet basil, I used woodsy sage. 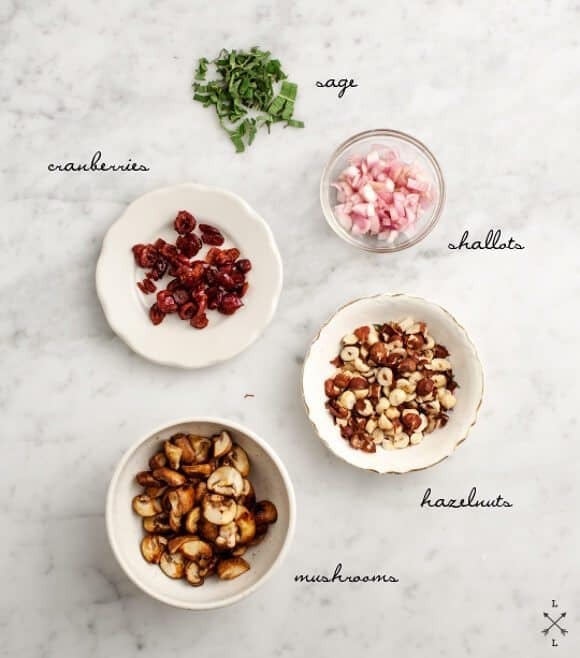 I normally toss pine nuts in my panzanella, but hazelnuts have been my nut of choice this fall, so I toasted those up instead. Make the dressing: Whisk together the olive oil, vinegar, maple syrup, shallot, pinches of salt and pepper, and red pepper flakes, if using. Taste and adjust seasonings, and set aside. Grill or toast the bread slices (I used a grill pan): Drizzle the slices with a little olive oil and grill on each side for a couple of minutes. You could also cook them under the broiler in your oven. Once the bread is done, rub it with the cut side of half of the garlic clove while it's still warm. Chop the bread into 1-inch cubes and place it in a large bowl. Set aside. Cook the mushrooms: In a medium skillet, heat a bit of olive oil over medium-high heat. Add the mushrooms and a few pinches of salt. Let them cook down until they begin to soften. After about 10 minutes, when the mushrooms are nicely browned and soft, add the remaining garlic and stir to incorporate. Cook a couple more minutes and add a splash of champagne vinegar or white wine to deglaze the pan. Let the mushrooms cook for a minute longer and remove from heat. Add the mushrooms to the bowl with the bread. Cook the kale: Drizzle the kale leaves with a little oil and salt. I cooked mine in the oven under the broiler for about 5 minutes until it was wilted down and the edges were a little bit crispy, and then I chopped it. Alternatively, you could cook the kale in the same pan as the mushrooms, adding the chopped kale to the pan during the last 4-5 minutes and cooking until it’s wilted down. 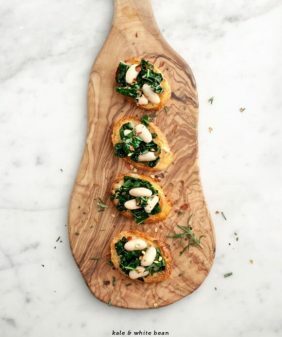 Place the kale and the hazelnuts, sage, and cranberries into the large bowl with the bread cubes. Add the dressing and toss. Taste and adjust seasonings. Serve at room temperature. You can make this up to 30 minutes before serving. 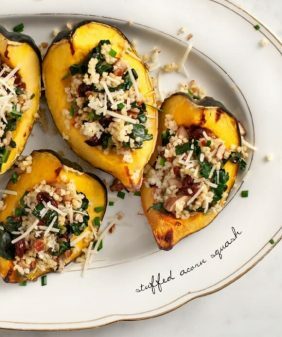 Love this fall twist on one of my favorites as well! 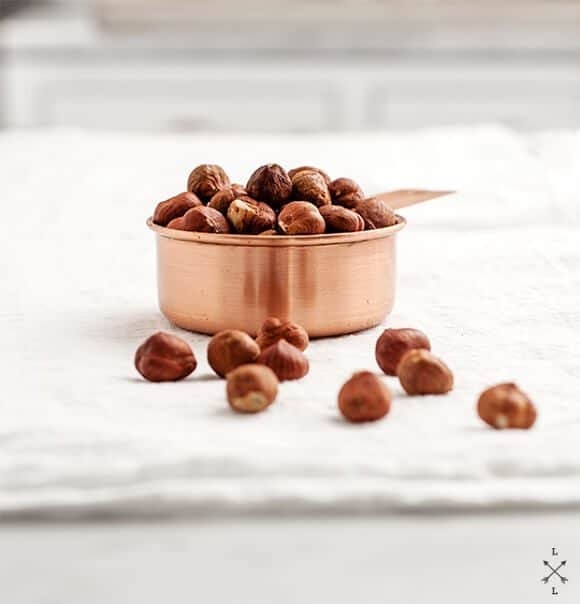 Also, I’m all about hazelnuts this fall…I put them in my salads, my granola, and just nibble away. Beautiful! Looks delicious. I have a jar of oven roasted tomatoes left over from late summer harvest which I might toss in. Looks like a good side for roast chicken too! I could eat this every single day. 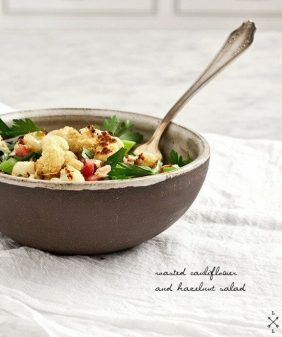 Love the simple dressing and the addition of shallot! That looks like my idea of delicious! I’m not sure I’ve ever mad the “original” version of panzanella before…somewhere there’s a recipe for a “spring panzanella” with white beans, leeks, asparagus, sun dried toms, crispy ciabatta and pesto which I love though. It’s like an inside out sandwich! Great way to use up day old ciabatta from the daily baked Artisan Bread in 5. What an awesome idea! 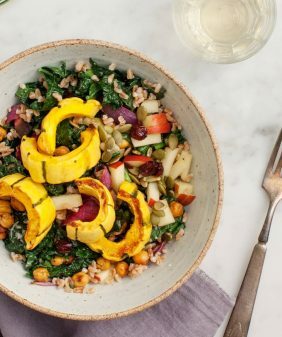 Panzanella is such a tasty dish, but a fall spin is so creative! I love learning new ways to use kale! I am excited to make this for the next “girls’ brunch” at my house. Panzanella should be enjoyed year round. It’s so delicious. Love this variation! This look delicious! I’d like to make it soon. Oh my gosh. 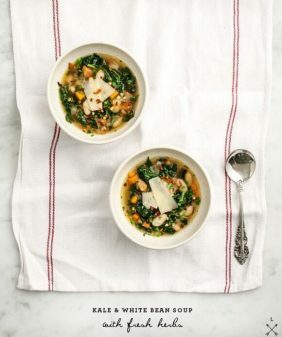 Not that I don’t totally love this recipe, but I’m really jealous of that copper measuring spoon! It’s beautiful. oh my goodness i need this now! just gunna use corn bread! and i loveee shallots!